One of the oldest area in Pune, Camp has a lot of things to pamper your taste buds and fulfill your cravings. You can’t say no to the pride of Maharashtra, the Vada Pav and who’s better than Garden Vada Pav Centre in Camp! 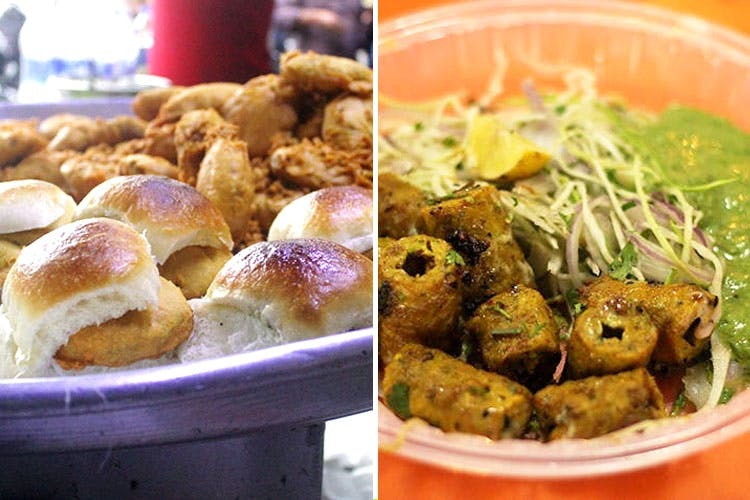 This modest food stall offers tasty Vada Pav, masala Buttermilk at very pocket-friendly rates. And the best is the left over small fritters for free! A must visit to this legendary outlet in Camp. Besides the famous, Garden VadaPav, is a small hawk-cart that serves some delicious, juicy and tender seekh kebabs which include chicken, mutton and beef. The beef kebabs here are offered at INR 40 per plate. Are you in a hurry and willing something on the go? Then you’ve reached the destination. This food joint serves pocket-friendly quickbites. You’re in a treat if you love chicken samosa, different types of rolls and farcha, and that too all under 50 bucks. For all the chaat-lovers out there, you found your heaven. Grab the mouth-smacking Pani Puri and other chaat items to get your taste buds partying in your mouth. Another must try is the bombay chaat. If the vendor asks you for another round of Pani Puri, you wont be saying ‘NO’! If you fall in that category which treats sweets as street food and go eat sweets like rolls or chaat(like we do), then this the address for you. Traditional sweets as well as bengali sweets are offered at minimal rate per piece. A sweet perfect end to your perfect street food tour in camp!